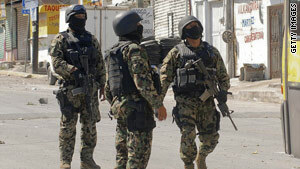 The Mexican military is fighting against drug cartels in the states of Tamaulipas and Nuevo Leon. Mexico City, Mexico (CNN) -- Five presumed drug gang members and one soldier were killed in shootouts Thursday and Friday after criminals blocked thoroughfares in two northern Mexico states to prevent military reinforcements from arriving, authorities said. The criminals used cars, transit buses and tractor-trailers to block roads and streets in the states of Tamaulipas and Nuevo Leon in northeastern Mexico, said an official with the Nuevo Leon public security office. The official was briefed on the incidents but declined to be named because she is not allowed to speak for the department. Three gang members were killed Thursday in Tamaulipas and two died early Friday in the city of Monterrey, in Nuevo Leon, the official said. One soldier was killed and four wounded in the Tamaulipas confrontation, the security official said. Two of the road blocks happened Thursday and five more were set up before dawn Friday, the official said. All were cleared within a matter of hours. The area, which borders Texas, has seen bloody fighting between the Zetas and Gulf cartels after a recent gangland slaying. Hours-long gun battles are common, and U.S. officials were recently forced to temporarily close the consulate in the city of Reynosa. The trouble started January 18 when a Gulf cartel member killed top Zeta lieutenant Victor Mendoza. The Zetas demanded that the Gulf cartel turn over the killer, but the narco group refused. The Zetas, composed mostly of former elite military troops, had been the armed enforcers for the Gulf cartel since 2001. The Zetas have become more independent in recent years, and the all-out war between the two cartels indicates the split is apparently permanent. Nuevo Leon public security chief Luis Carlos Trevino was quoted in published reports as saying that the military will continue ongoing operations against the criminals despite the road blocks and other obstacles. Soldiers carried out raids Thursday in the cities of El Carmen, Sabinas, Vallecillo and Paras. "The organized crime groups have tried through different means and methods to turn the roads of the metropolitan Monterrey area upside down, looking to form blockades with civilian vehicles to prevent support troops going to the areas where these actions are taking place," Trevino said at a news conference Thursday. The drug gang members used tractor-trailers, buses and cars to close the Reynosa Highway and the road to Miguel Aleman, causing panic among residents and traffic chaos, the security chief said. The highway from Monterrey to Reynosa was closed for at least two hours in both directions when armed men forced at least six car drivers and a tractor-trailer driver to station their vehicles across the road. The gunmen also burned three cars and a pickup truck to close the Miguel de la Madrid Boulevard in Monterrey. In addition, gunmen stole several cars and trucks to use as roadblocks in both directions on the highway to Miguel Aleman, Trevino said. Mexico has been gripped in massive drug-related bloodshed since President Felipe Calderon declared war on the cartels shortly after coming into office in December 2006. Much of the violence has centered around Ciudad Juarez, across the border from El Paso, Texas. Juarez drew attention in the United States last weekend when three people associated with the U.S. consulate in the city were gunned down. Two of the victims were U.S. citizens who lived in El Paso. Juarez Mayor Jose Reyes Ferriz said earlier this week authorities believe Saturday's slayings were carried out by the Barrio Azteca drug gang. No motive has been revealed and no arrests have been made. About 200 U.S. federal, state and local authorities interviewed more than 100 Barrio Azteca members and associates in El Paso and southern New Mexico on Thursday, the Justice Department said. There are no official government tallies, but more than 16,000 people are estimated to have died in the drug wars. The vast majority of the deaths are among reputed criminals, with some police and military also being killed. Relatively few of the deaths are civilians. Even so, the United States and Canada have issued travel warnings, particularly along the border area. The Texas Department of Public Safety took the unprecedented step this year of recommending that students on spring break not go to border areas inside Mexico. News of the violence and the travel warnings apparently have had an effect. Mexicans say tourism along the border has declined this year, with one business owner in Tijuana telling CNN that his business has dropped 40 percent.